Skate parks are all well and good in the daytime when skaters can see where they’re going, but what about at night? Korean artist Koo Jeong-A has come up with a solution—night-skating with glow-in-the-dark skate park which has been built in Vassivière Island, France. Drawn to the surrounding mysterious wooded French landscape, the Korean artist wanted to create a dreamscape amidst the natural surroundings. The artwork is something that is meant to live and be used providing a sensorial experience to skaters and spectators alike. As well as the practical application of allowing skaters to practice their craft at night on the park’s different bowls, cradle, and tunnels, it’s also supposed to be experienced as an artwork—as a sensorial landscape, integrated into its surroundings, that plays with light and shadows. 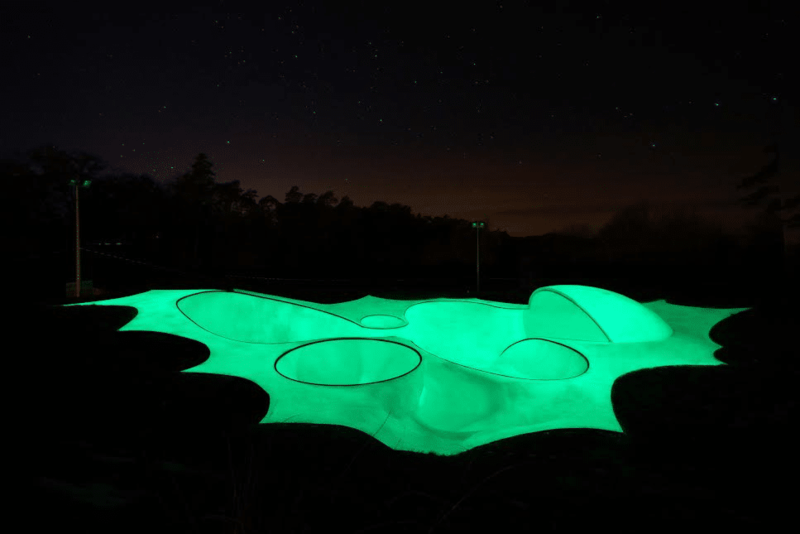 Called Otro, this “skateable sculpture” is made from green phosphorescent concrete so it gives off a radioactive glare, which enables skaters to pull some amazing tricks without bumping into one another. Koo Jeong-A has designed a concrete sculpture which features a composition of different bowls connected by three different tunnels. 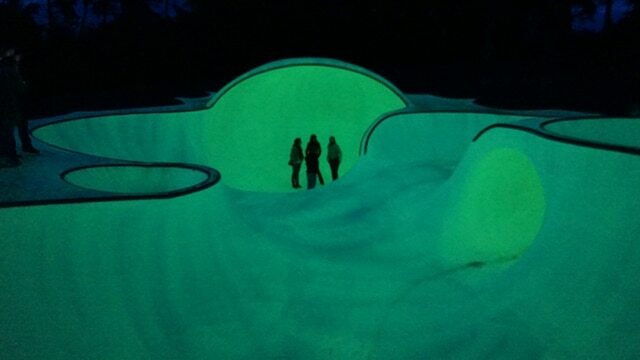 located on Vassivière Island in France, “Otro” stands as a fully functioning skatepark, but this one’s a little bit different – it’s glow-in-the-dark eliminating the complications of an evening skate session. Since the 1990s Koo has been working on the reinvention of spaces with site specific works. Her works frequently include architectural elements, drawings, fictions, poetries, publications, installations, sculptures, films, audio works and architecture projects. Koo’s most recent project is a glow-in-the-dark skatepark series. The first skatepark named OTRO was built in 2012 in collaboration with L’Escault Architectures, and was erected on Vassivière Island, France. The second, EVERTO, was built in 2015 in Liverpool, UK for the 2015 Liverpool Biennale; and most recently ARROGATION was built in 2016 in Sao Paulo for the 32nd Bienal de Sao Paulo. Artist Koo Joeng-A in front of “Evertro”. 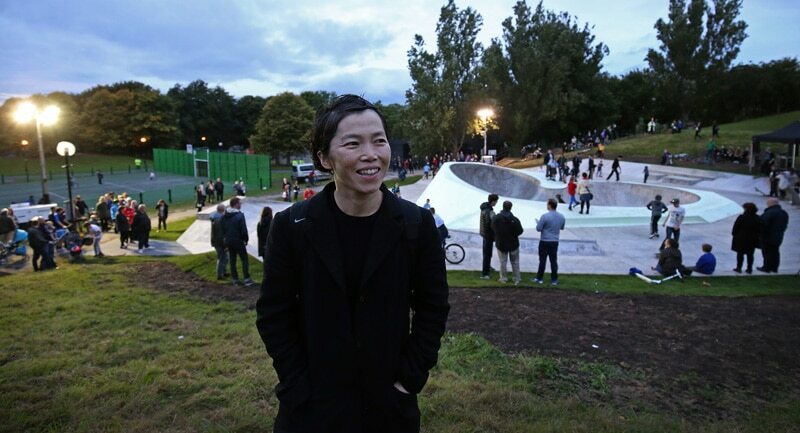 The artist, in association with specialist designers Wheelscape Skateparks, worked with young people from North Liverpool and skaters to devise the new wheels park for Everton Park. Familiar skating features have been combined with new sculptural elements to create a unique space for experimentation. The artist’s design for the central bowl, which includes glow-in-the-dark features, responds to its immediate surroundings in Everton and is intended to offer visitors a space for contemplation. World Premiére of "Mental Banquet: Painting with Lights"